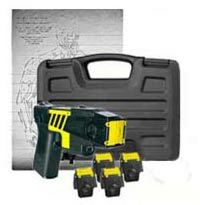 Compare TASER models with our TASER model comparison chart that includes package contents, warranty, power output, battery info, specifications and more for the TASER Pulse, TASER Bolt, TASER Advanced M26c, TASER X26c and TASER X2. On occasion TASER device owners have been known to fire their unit at an assailant, and then drop or simply lay down the device and run. If your TASER Bolt, TASER Advanced M26c or TASER X26c is used for self-defense, and is left behind at the scene, send the manufacturer a copy of the police report documenting what happened and they will replace your unit free of charge. TASER Lifetime Replacement Guarantee is not available or applicable for: (a) on any international (Non-United States) sales or uses of TASER devices; or (b) to any Purchaser who uses the TASER device in a professional capacity. Click here for more information on the TASER Lifetime Replacement Guarantee.